I was recently browsing around my own site, in particular the recipes page. It was then that I noticed I hardly have any vegetable recipes. I promise, we really do eat veggies, quite a lot actually! Most vegetables we make are pretty simple, roasted or grilled. I guess that is why I haven’t posted more recipes. This particular recipe is a family favorite so I figured it was finally time to post it. I never had brussels sprouts growing up because my mom couldn’t stand them. Obviously she wasn’t going to make them if she wouldn’t eat them! That changed many years ago when she started roasting them. I figured I would give it a try too. I started by roasting them with just olive oil, dijon mustard, salt and pepper. They were pretty tasty. The boys even ate them, without complaining! Always a success in my book if everyone will eat them. Then I got a little more adventurous and added honey to the dijon. Also popular. And then the dried fruit and nuts, perfection! Now the boys were actually asking for brussles sprouts for dinner. This is a very simple dish to prepare, yet it is full of flavor and pleases any veggie lover. It is great for the holidays, especially Christmas since it is red and green. Of course we enjoy it year round, can’t get enough of it. If you have picky kids, give it a try. The honey and dried cranberries give it a sweetness most kids will enjoy. You could also change things up. I have used slivered almonds and I imagine dried cherries would also be great. Preheat oven to 400 degrees. Put the cranberries in a small bowl and add about a cup of very hot water. Allow to sit and plump up for 5 minutes. Whisk the honey, olive oil, mustard, salt and pepper in a medium sized bowl. 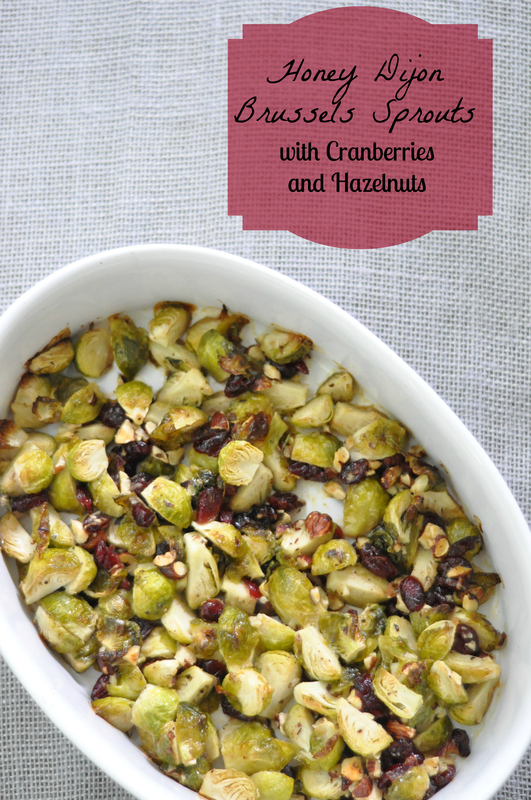 Add the plumped cranberries, hazelnuts and brussels sprouts. Stir to combine everything thoroughly. Pour in an oven safe dish and bake for 30 minutes. Thanks! Definitely a holiday favorite in our family. Yum! 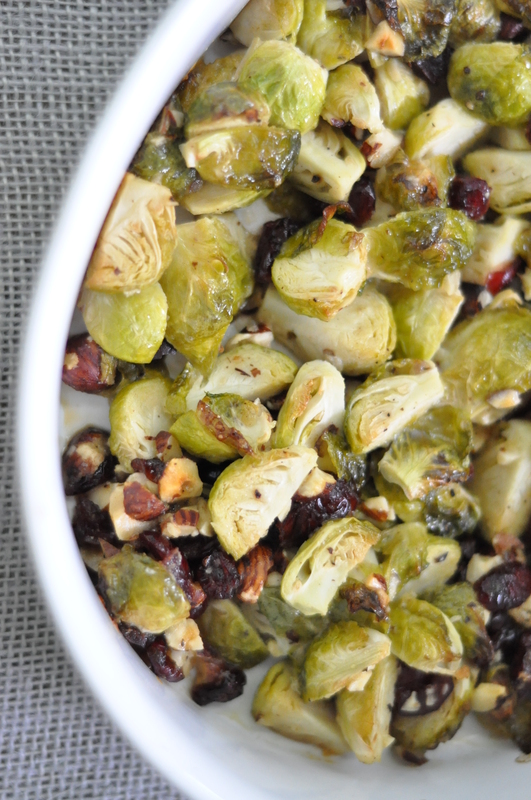 Two of my favorite things- hazelnuts and Brussels sprouts! We are getting ready to start Brussels sprouts from seed for the garden, hope it works! And yes to hazelnuts! I am hoarding a two pound bag in the freezer my mom brought back from a trip to Seattle. I know, such a yummy veggie isn’t it?! Thank you! They are indeed a yummy vegetable. We are getting ready to try to grow them in the garden. Thanks Liz! Yes, the boys love Brussels sprouts. My oldest even asked for asparagus at the store the other day. Then there are addy like today…I made stuffed acorn squash for dinner. They all made horrible faces and fake gagged! Needless to say not a one of them liked it! After giving them more filling (brown rice and black beans) and mixing it thoroughly with the squash they managed to finish. 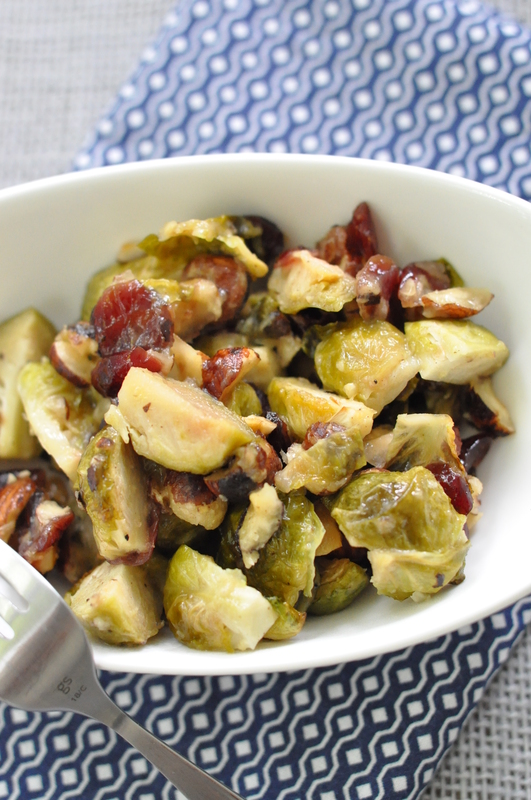 There is a gene that makes people dislike sprouts – honestly true. My daughter has it. Luckily it sounds like your sons do not 🙂 I love sprouts. Luckily none if us have it. Kind if like cilantro, either people like it or hate it! Enjoy your dinner tonight! Dried cherries would be great. We’re having friends over tonight to pre celebrate hubby’s birthday. Tomorrow is the big 40! My vegetable category is almost empty too. I keep on hoping, I’ll start but I never seem to get there! I hope I’ll find time to give it a boost. The weather here is pretty cold already. I’ve been eating a lot of soup. The recipe sounds delicious. I love honey, nuts and the tang of cranberries so I plan to give it a try. Perhaps my picky daughter will like it too! Have a great weekend! Somehow the veggie category is the neglected stepchild! I will have to work harder on that. The nuts, honey, mustard and cranberries really do bring it all together! Enjoy your Sunday!